We write all different types, from military sci-fi to science-fiction romance, and we’ll use this blog to share our thoughts on all of the above (and more) with you. The authors here (your friendly hosts on Contact — Infinite Futures) all have books published or forthcoming from Carina Press. The above authors will post on Monday, Wednesday, and Friday of Week 1 and Monday and Wednesday of the following week. This multi-author blog is a splendid idea as it offers readers a one-stop portal to learn about Carina Press’ SF/SFR titles and authors. With the ebook market still rather fractured, it really helps to have resources such as online communities with a specific focus. The author consortium the SFR Brigade is another way readers can learn about authors and their SFR titles without having to travel all over the Web. CONTACT – Infinite Futures is also sending the message that Carina Press and its authors want to interact with readers. Accessibility and the fostering of open communication between authors, publishers, and readers are key items that will give digital publishers an edge as the ebook market expands. There are only a few posts up at CONTACT – Infinite Futures, so I thought this would be an ideal time for me to present an unsolicited wish list about what I’d like to see happen there. While the blog is and should be focused on the SF/SFR titles Carina has to offer, it’s also about me, the reader. Me, me, me! *Teaser posts about forthcoming releases. Be creative. Drive me nuts with anticipation. *Behind the scenes posts about the releases, such as what inspired the author to write the story or an interesting path to publication (if applicable). Be careful to avoid spoilers, though! *An occasional post on craft would be interesting as it pertains to SF/SFR. For example, blog about what readers can expect from an SF-romance blend and the important elements that go into such stories. *Thrill and mesmerize readers with cool discussions covering the range of sci-fi elements found in the authors’ books. Plausible, fantastical—it’s all good! *Likewise, describe all the variety of romances and heat levels found in the stories. SF and SFR are all about diversity. *Topical posts that tap into ongoing discussions at the SF/SFR communities, especially if the issue ties into one of your books. *Pay it forward with “if you like my book, try [insert name of similar title].” Readers will appreciate having even more entertainment, and will remember you for it. *Educate me about digital publishing (e.g., the production of SF/SFR titles). Start a conversation about ebooks and the advantages they offer for niche subgenres. *Authors with strong opinions. Express your voice, take a stance, go crazy with humor, and riff off of posts by your fellow authors. Now, that’s what I call entertainment! So that’s my wish list. What about you? 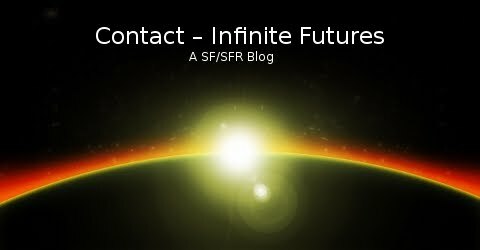 What type of features or posts at CONTACT – Infinite Futures would interest you? What kind of information and entertainment are you seeking?